1. Read the care tag. Only water the plant when necessary, pay attention to sunlight requirements, and always monitor the leaf condition (soft and yellow is too much water, crunchy and brown is not enough). 2. Buy a good pot that won't suffocate the roots. If there's water sitting in the bottom of your plant, the roots will get mouldy and the plant will slowly die. Either get a pot that has drainage holes and a plate at the bottom, or water infrequently and avoid squishing a ton of soil into the pot. 3. Give it room to breathe. It's important to keep your house plants in a room that gets fresh air flow and natural sunlight. Consider adding some "plant food" liquid or extra soil if your plants are looking a bit lacklustre, and keep the area dust-free (bugs like dust!). Outdoor plants probably won't survive in an air-conditioned/heated house, so always look for house-appropriate ones. 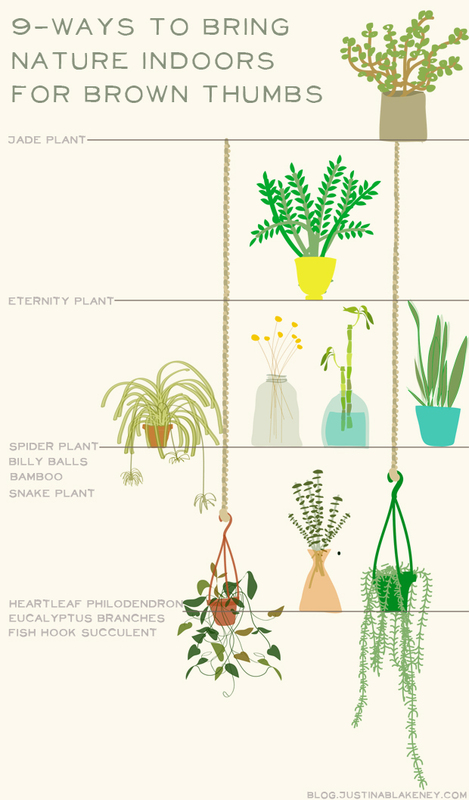 Now, here are some benefits to having house plants! If you're looking for something with flowers, I'd recommend a small Kalanchoe. They're inexpensive and can re-bloom a few times if you're lucky. I also love the look of those bamboo sticks that you can get for $3 or so at IKEA. I love Ikea but....THEIR PLANT POTS NEVER HAVE ANY HOLES IN THEM! WHAT GIVES, IKEA? WHAT DO YOU HAVE AGAINST MAINTAINING HEALTHY PLANTS??? I keep a few plants in the home office, just because they add wonderful colour to the overall space. Personally, I'd say no to flowering plants just because they're much harder to grow indoors, but I've got a few succulents, herbs, and spider plants in my office that do quite well. Yes omg what a pain eh!!! Luckily none of mine have gotten moldy. (ew) But how hard is it to give us a holy pot?! haha and totally onboard with leafy vs. floral. less dead leaves to take care of = happy me. My bf has been taking care of the large Pachira tree up there for a few years, and shockingly enough, it's in AMAZING shape. He also has the bamboo sticks in his place from IKEA that have sprouted like 2ft leaves off the top! crazy. The key is not over watering for the Pachira, since it has no drainage. He keeps it to like once every week/ week and a half.